1844 Born the son of William George Allen of Cardiff. 1863 His mother bought him an old foundry and forge in Cardiff (at the age of 19). 1865 Married Anne Mary Pemberton Howell and they had twelve children. 1869 Disposed of foundry and forge in Cardiff and 'took his way to London'. 1883 Associated himself with Dr Gisbert Kapp, who designed a dynamo which could be coupled direct to an Allen machine for the generation of electricity for lighting aboard ship. 1903 "ALLEN, W. H., J.P., Bromham House, Bedfordshire. Car: Electric. Is founder of the Queen's Engineering Works, employing about nine hundred men. His son, Mr. George Allen, is a well-known designer of motor garages. Club: A.C.G.B.& I." WILLIAM HENRY ALLEN was born in 1844, and was educated at Weston-super-Mare and at Christ College, Brecon. He afterwards served an apprenticeship with Richard Neville and Co., of Llanelly, who specialized in large colliery engines. It was in his native city of Cardiff that he managed his first foundry, but although scarcely twenty-one years of age, his ambitions were soon dissatisfied and in 1869 he became general manager at the Essex Street works of Messrs. James Gwynne and Co.
His originality sought complete independence, and after eleven years he established the great firm associated with his name, in York Street, Lambeth, adjoining the London and South-Western Railway. Here he was successful in developing a distinctive high-speed engine and centrifugal pump, and in 1883, in conjunction with Dr. Gisbert Kapp, designed the first direct-coupled high-speed engine and dynamo set. The latter, after being fitted experimentally in the old twin-screw battleship H.M.S. Devastation, initiated a long series of auxiliary power sets that gained the high esteem of the naval and mercantile marine authorities. Such rapid progress, and the circumstance that the railway company were anxious to buy the freehold of the York Street site, enabled Mr. Allen to move his business to Bedford in 1894, and in making this fresh start he took into consideration the educational needs of his employees and their children. On their behalf, also, he set up organizations which anticipated the Workmen's Compensation Act and the old-age pensions legislation. In 1920 the style of the firm became W. H. Allen, Sons and Co., Ltd., Mr. Richard W. Allen, Mr. Harold Gwynne Allen, Colonel P. B. Crowe and Mr. Rupert Allen having meanwhile been associated with the firm as directors. 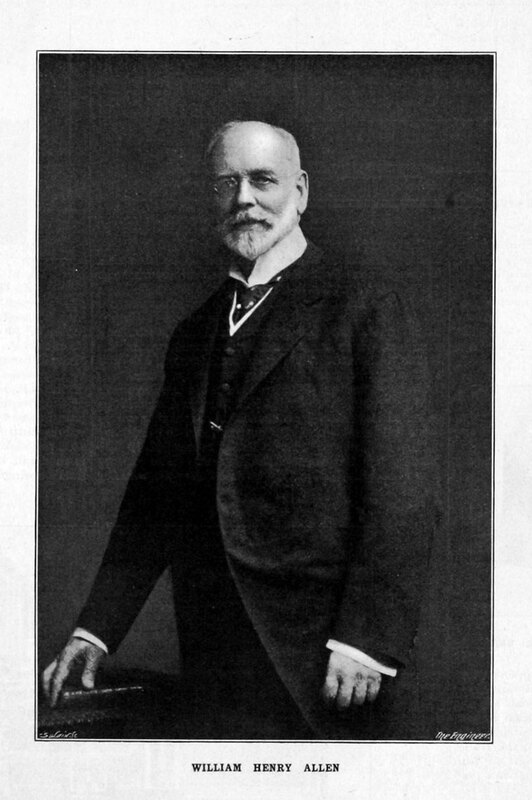 Throughout all this period, Mr. W. H. Allen directed the firm's affairs as Chairman. In 1913 a visit was paid to the works at Bedford by the Members of this Institution, and on 27th June 1918, Messrs. Allen were honoured by a visit from His Majesty King George V. and Queen Mary. Mr. Allen was a pioneer in the systematic training of his engineering pupils and he was rewarded by their consistent success and their continued affection. He was a J.P. for the county of Bedford and became High Sheriff in 1904, and was also a Deputy-Lieutenant and a member of the Territorial Association. Mr. Allen became a Member of this Institution in 1885 and a Member of Council in 1906. He was also a Member of the Institution of Civil Engineers. In 1915 he was elected a Vice-President of this Institution and in 1921 a Past Vice-President, ill-health having rendered his elevation to the presidential chair impossible. To him the Institution owes the foundation of the Benevolent Fund, and the Grant of £1000, which bears his name, to enable a Graduate, selected by the Council of the Institution, to spend three years in the Engineering School at Cambridge University. Mr. Allen died on 3rd September 1926, at Bromham House, Bedford. WILLIAM HENRY ALLEN, D.L., an original Member of the Institute and Member of Council from 1915 to 1924, died on September 3, 1926, at his residence, Bromham House, Bromham, near Bedford, at the age of eighty-two. He was born at Cardiff and was educated under John Elwell, Wallescote House, Weston-super-Mare, and Christ College, Brecon, and was trained as an engineer. Messrs. W. H. Allen, Sons, and Company, Limited, which was incorporated in 1900, and of which Mr. Allen was founder and chairman. He was an expert in pumping machinery, and his works were responsible for much of the pumping equipment of large irrigation schemes in Egypt. He also developed the direct current dynamo, and installed electrical equipment in vessels of the Royal Navy and Mercantile Marine, and in dockyards. The dockyards of the Japanese Admiralty, in particular, were equipped by the firm. During the war he quadrupled the output of the works. Mr. Allen was a lover of outdoor life, including hunting, shooting, farming, and gardening. He was also an organist of no mean ability. In Bedford he was known for his interest in the welfare of his workpeople and his generosity. He was the principal donor of the church which now stands in Queen's Park. He was twice married, and leaves five sons and five daughters. One of his sons fell in the Great War. Three of them are now associated with the company, Mr. Richard Allen, C.B.E., a member of the Institute, being managing director. Both he and his brother, Mr. Harold Allen, have been high sheriffs for Bedford. shire, an office held by their father in 1904. Mr. George P. Allen, another son, is a well-known architect. Mr. Allen was a member of the Royal Institution and the Institution of Civil Engineers, and a Vice-President of the Institution of Mechanical Engineers. This page was last edited on 4 December 2017, at 09:44.